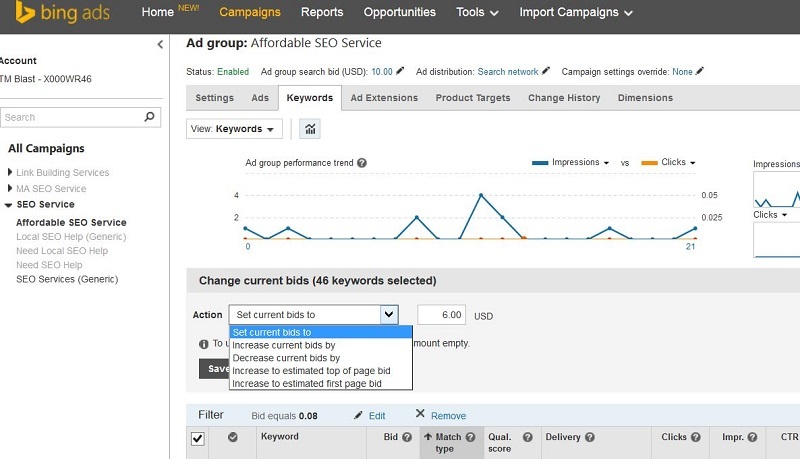 If you are looking to save time in your Bing Ads campaign, you should use the quick edits section for the match and bid type. 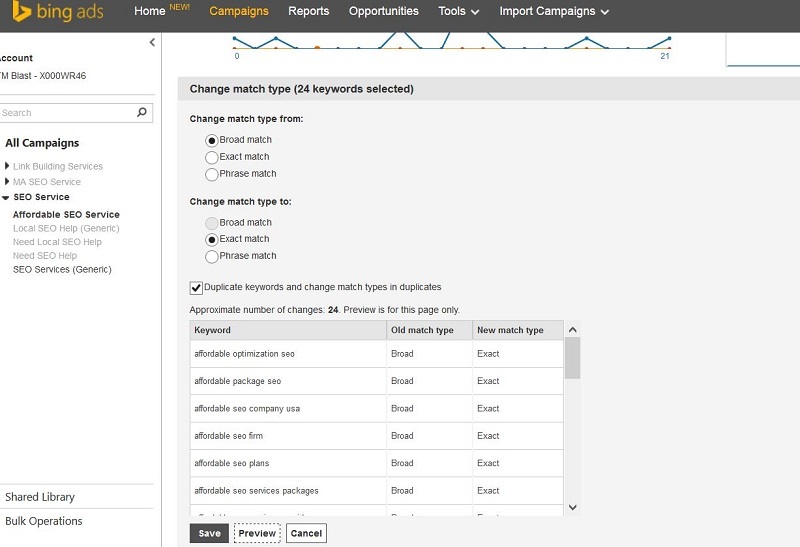 You can use this section to change the keywords bid and match type in a matter of seconds. Learn how to use this now! Here are the keywords that I brought over from the opportunities section. 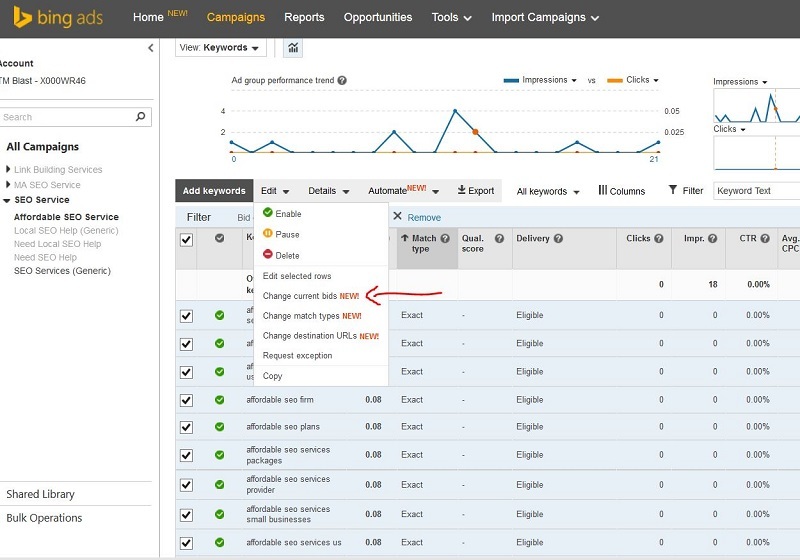 You will notice that these keywords are in broad match mode. Bing showed me a bunch of keywords that can help increase the impressions and clicks, so I decided to add a few of them. Once I added the keywords, I noticed that they were in broad match. In my campaign, I just use phrase and exact. I do use broad match modifier for a few terms, but I will keep this pretty basic. Instead of going keyword by keyword and changing the type, I am going to do all of them at once to save time! After I have selected the keywords, I clicked on the section called edit. Once I am in the edit section, I will click on change match types. Next, you want to check off what you are changing the keyword from and what you would like the match type to be instead. You can also check off the box to duplicate the keywords and change those match types too.I would recommend doing this because if you don’t, Bing Ads would then delete the broad keywords and permanently change them to whatever match type you would like instead. For this example, I wanted to move all the broad keywords to phrase and exact, so I clicked on duplicate the keywords so I can pretty much do the exact same step, but change the type to the other option that I did not select. As a note, I checked off the preview section so I can show what the change will look like. This is just a good safety check before you go live. Here are the 69 keywords I want to change the bid for. You will notice that the bid is all set at the same level. I simply go to the edit section and click change current bids. This is a cool section. You can simply put a default bid on your keywords to be adjusted to, or you could even change it to more options. For this example, I am just going to change it to a simple bid adjustment. For myself, I like to manually review the keywords and change the bids later on based on the click through rate, conversion rate, quality score, and more. By setting everything to the same bid, I am trying to get quick data at a pretty equal measure. This is a neat section within Bing Ads that I actually did not know about until today. I used the opportunities section and realized that it would take a lot of time to change all the bids and match types after I imported new keywords over. Luckily, I noticed the edit section and was able to quickly change the bids and match types in seconds. This is a great too if you only can dedicate a small amount of time in Bing Ads for your client or even for yourself. 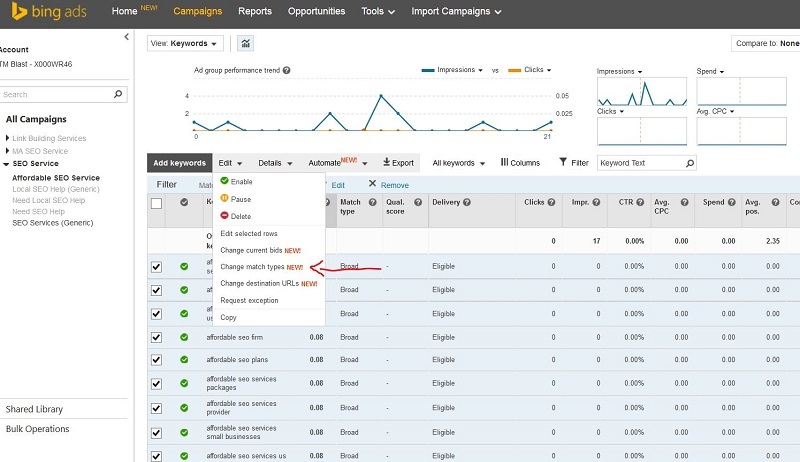 The ability to add new keywords and change the bid and match type in moments allows you get a lot done in just a short amount of time.